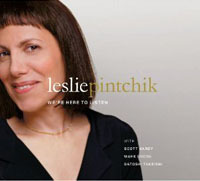 Leslie Pintchik inhabits an ocean of sound by herself and much more with her trio. The pianist creates her own ebb, and rip currents with the undulating swell of her playing. Her technique is flawless, and she has a natural tendency for irony, and even humor, as she simply spreads her hands on the keyboards and lets her fingers do the singing. She does, indeed, favor the vocal pursuit of music, as her songs unfurl like diaphanous arias swelling in the onrushing waves of melodies that gush forth with quiet, never-ending power. Her idiom is, at once, as highly literate and cerebral as it is passionate and so organic, that its source of power seems to come directly from the soul, from the very natural. 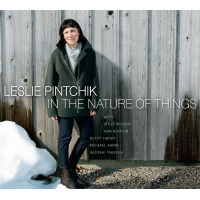 Pintchik favors soft, thoughtful lines prompted by the linearity of the melodies themselves, but her deep understanding of harmony allows her to be endlessly creative when it comes to the vertical architecture of the song. Thus her soli are marvelously complex, like the whorl of molecular musical DNA. She pitches these at bassist Scott Hardya magnificent partner in song, whose harmonic ingenuity enables him to be the perfect harmonic foil. Hardy literally plays his bass like the violin in the lowest register, but he is also adept at inhabiting the high register, singing with abandon as he solos up and down his instrument's strings. Drummer Mark Dodge is a percussion colorist with a sublime touch and with the artistry of percussionist extraordinaire, with percussionist Satoshi Takeishi there to add colors not visible to the eye, but to the mind's inner ear; the quartet exceptional in a manner that only ensembles like Keith Jarrett's trio are. We're Here to Listen is that album that takes a lifetime to make and another to enjoy. It has all the fabled nooks and crannies that artists give their works of art. Hidden phrases, rhythmic twists melodic highs that spring forward upon the eleventh hearing of the album. But first things first: this is a rare collection of songs that aims its emotional arrow straight at the heart, while maintaining its highly intellectual quality. Bob Dylan's mighty anthem, "Blowin' In The Wind," echoes with the legends with which the songwriter imbued it, while "I Can't Make You Love Me" is quite simply the album's most beautiful melodic extravagance. 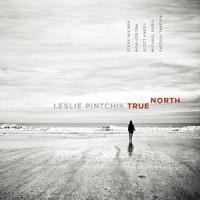 But the crowning glories of the record are the songs written by Pintchik herself. 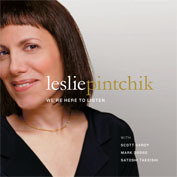 "There You Go" and "Ripe" are stupendous, marking Pintchik as a songwriter both mature and beautifully sensitive. 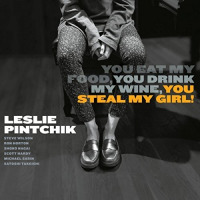 It bears mention that Pintchik and the musicians in this quartet have also released a DVD at this time, together with a CD-only of the music of Live in Concert. What joy to watch an ensemble so attuned and sensitive to each other's music. This is what makes "Completely" and the medley "Somewhere/Berimbau" so superb, and as memorable as this other CD, We're Here to Listen.